SQL (Structured Query Language) is a language used for performing operations on a relational database. 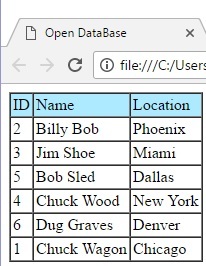 A relational database is data organized in a set of tables. It's called a relational database because the tables (or the collection of data in them) have relationships between them. A relationship, in the context of databases, is when a table has a foreign key that references the primary key of another table. There are three types of relationships: One-to-one, where the primary key relates to only one record in the related table; One-to-many: where the primary key relates to many records in the related table; Many-to-many: where each record in both tables can relate to any number of records in the other table. There are many other types of databases besides relational. Some use a key-value method to store data. Some use wide columns, like a spreadsheet, to store data, Some use a tree-like structure (hierarchical) to store data. But no other type is as powerful or efficient as a relational database. However, efficient relational databases are difficult to design, that's why the average database developer's salary is over $100,000 per year. To learn SQL usually requires that you install a RDBMS (Relational Database Management System), like MS SQL Server or MySQL on your computer. I don't know about you, but my computer is over-loaded with applications, so I'm reluctant to install such a huge application on it. That's where WebSQL comes in. The down side is that WebSQL is supported only in Chrome and Safari (and Android and iOS by extension). Since 2010, it has been deprecated by the W3C (World Wide Web Consortium) because the other browser developers (Microsoft and Mozilla) didn't participate in the working committee. So if you want a cross-browser standard, you'll have to use IndexedDB, which is nothing more than a larger storage area for cookies. On the other hand, Chrome, Safari, iOS, and Android are the most popular browsers and operating systems on the planet, and knowing what Google and Apple plan to use WebSQL for, I don't expect them to drop it any time soon. In fact, I think when Microsoft and Mozilla wake up and figure out what's going on, they'll quickly dedicate the required resources. But, in any case, this provides a great opportunity to learn SQL with nothing more than Google Chrome web browser (and a text editor). To test for WebSQL Support, type the code shown below into a plain text editor (Windows Notepad) and save the file with a name with the .htm extnsion, e.g. test.htm. Then open the file in your web browser.